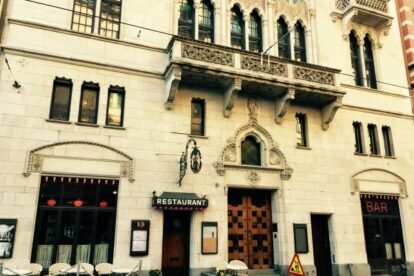 One of Stockholm’s historical restaurants is Konstnärsbaren (KB for short), residing in one of Stockholm’s most magnificent buildings called Konstnärshuset (the house of artists). The house was built in the late 1800s and was meant to be the centrepoint for all artists living in the capitol. Originally, there was a small beer hall in the house where artists could gather, but the discontent of the venue was so harsh that it soon gained the somewhat unflattering epithet “Konstnärshuset’s shame and the artist’s own personal horror”. This all changed in 1931 when a new owner took over and opened a new establishment: Konstnärsbaren. KB quickly became a hotspot for the contemporary celebrity elite and still today you might run into some well known faces. The walls of KB are filled with art, both murals, paintings and statues. Not to sound too pretentious, but you kind of feel like a decadent wannabe philosopher circa 1940, when you strut into this place. Yet, it doesn’t feel dated or old. The mixture of people is great and while you may find an old man in the corner reading Le Figaro, you also meet young people who stopped by for an afterwork. KB has been mentioned in Guide Michelin as a Bib Gourmand (high quality food at reasonable prices) and though they’ve lost their one star, they still serve wonderful food. Try the Wallenbergare with green peas, lingonberries, mashed potatoes and butter. You won’t be sorry. KB really is a dining experience you don’t want to miss.